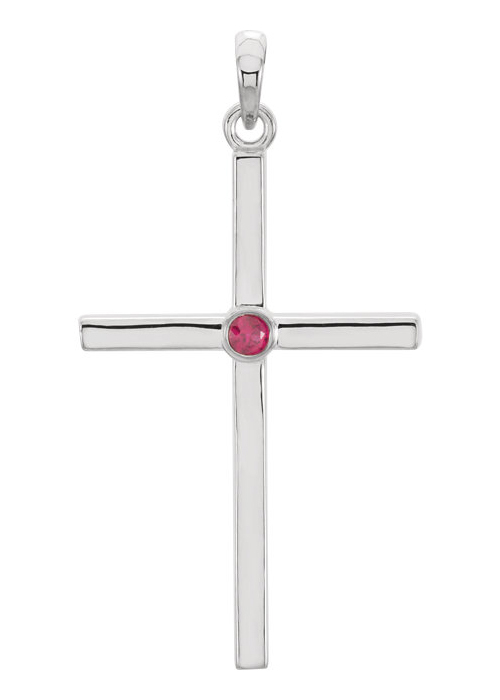 A 2mm ruby gemstone sits in the middle of this beautiful ruby solitaire cross necklace in 14K white gold for women, from Apples of Gold Jewelry. The soft red color of this AA rated ruby gemstone, along with the white gold of the cross pendant, makes for a stunning look that you will fall in love with. The gemstone, which is bezel set into the smooth and polished women's white gold cross pendant, is 2mm in size, adding just the perfect amount of color to this 1.20 inch tall by 0.65 inch wide cross pendant! The pendant looks brilliant on any chain you already have, or one that you might purchase. "And walk in love, as Christ also hath loved us, and hath given himself for us an offering and a sacrifice to God for a sweetsmelling savour. "(Ephesians 5:2). We guarantee our Ruby Solitaire Cross Necklace, 14K White Gold to be high quality, authentic jewelry, as described above.